Relish is located at second floor of Gurney Paragon facing toward Gurney Drive (same row with Canton-i with open air area) and is the latest addition to The Chicken Rice Shop (TCRS) Group. 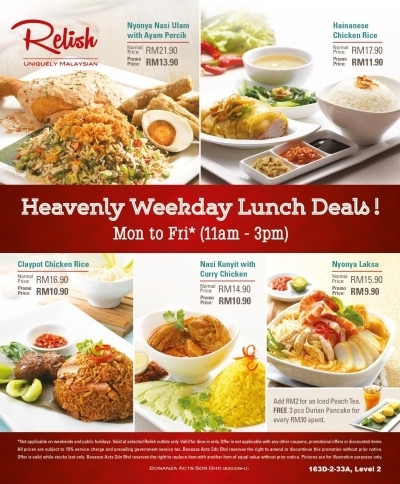 TCRS should not be a stranger for Penangites as the famous chicken rice shop can be found in most shopping malls. 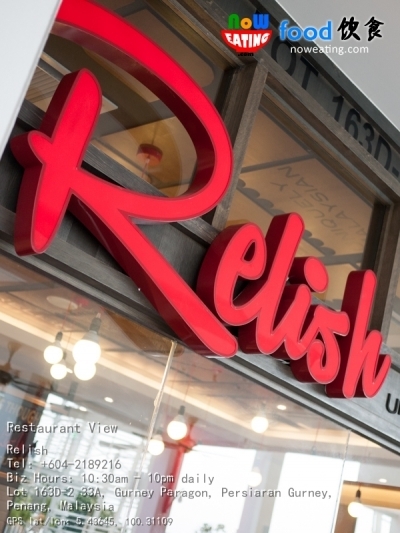 Unlike TCRS which serves mainly chicken rice products, inside Relish, you will find many classic Malaysian cuisine as well as new delectable flavors. Relish means “great enjoyment”. The restaurant is decorated with contemporary furniture and finishing accented with Malaysian inspired vintage wall displays and antiques. Having all local specialties under one roof is not new in Malaysia such that they are usually available in food courts. Having specialties from different regions of Malaysia, however, is a challenging task. 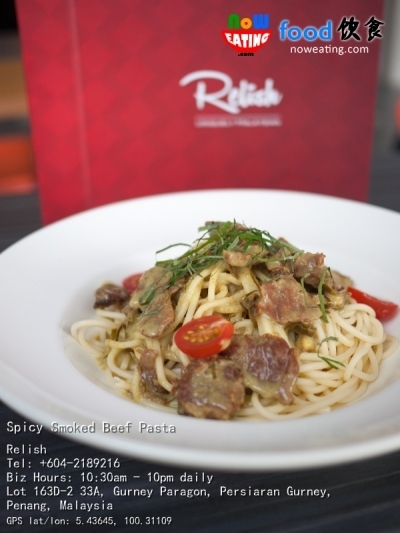 Relish did a lot of R&D to ensure that not only their dishes are authentic compared to original recipe, but also at utmost quality. Instead of outsourcing their ingredients, they have their own dedicated suppliers with most of their food prepared fresh in the premise. 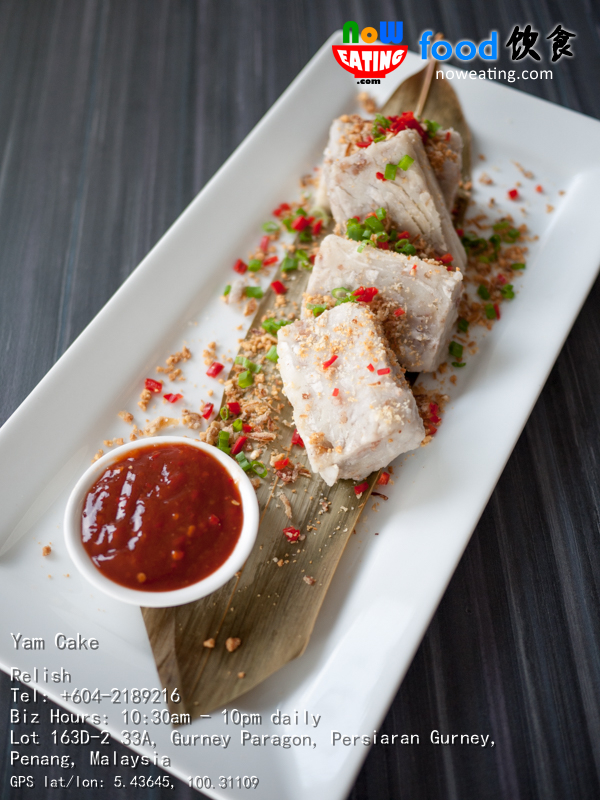 Yam Cake (RM9.90++), for instance, is made fresh from kitchen and is stuffed with generous amount of yam chunks, unlike fluffy version found in some Chinese restaurants. 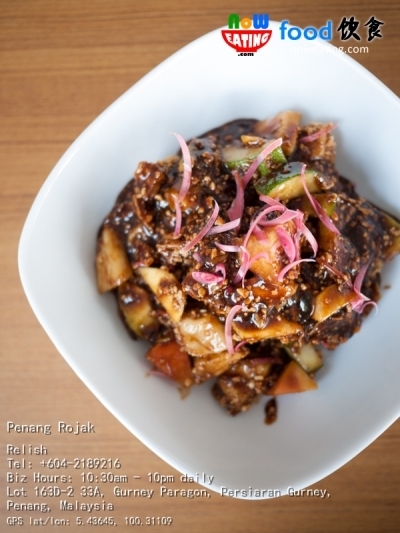 Penang Rojak (RM8.90++) is made of fresh fruit and vegetable salad with homemade high quality shrimp paste sauce, which means less fishy taste and smoother texture. The added ginger flower is a plus. 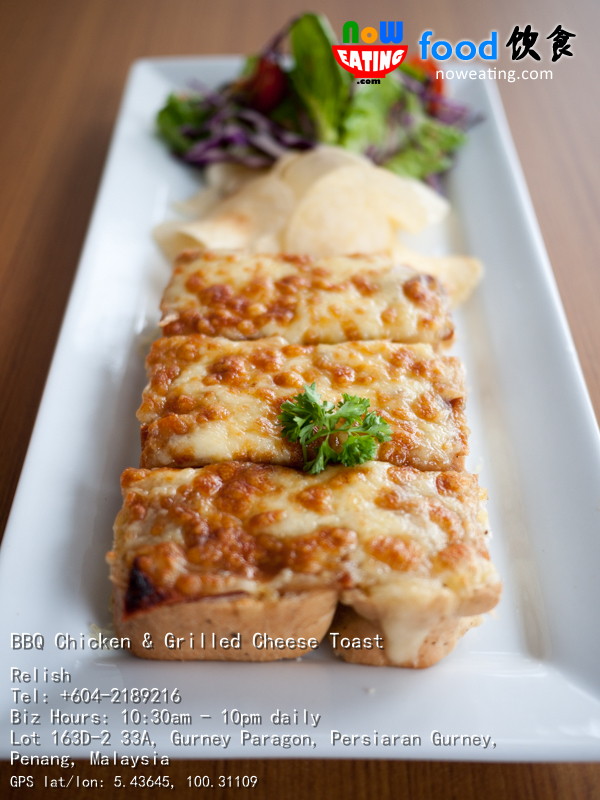 BBQ Chicken and Grilled Cheese Toast (RM13.90++) is a fancy light bite in which the Focaccia bread (oven-baked Italian bread similar to pizza dough) is topped with dried barbecued chicken and grilled cheese. Best enjoyed when it is still hot. 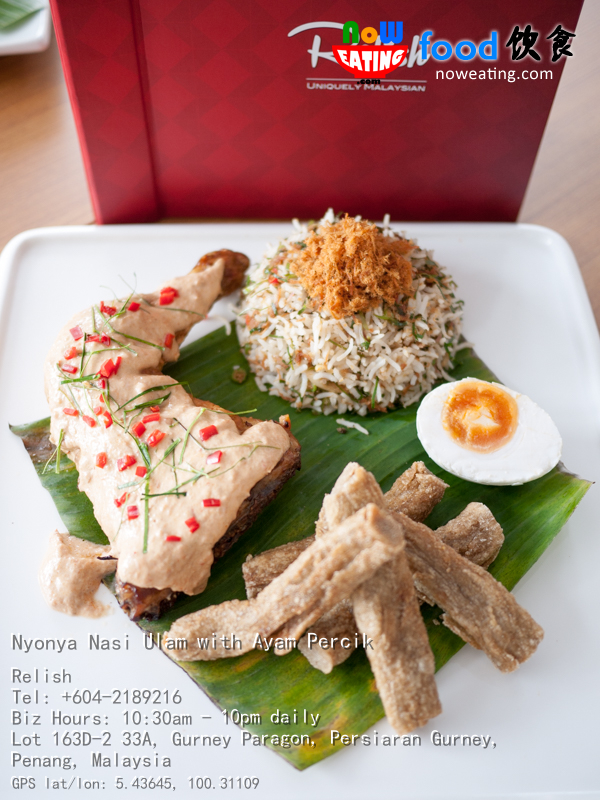 Nasi Lemak – the famous breakfast uniting all Malaysians, is repackaged by Relish into “luxury” edition with added Rendang Ayam Kunyit (RM16.90++). 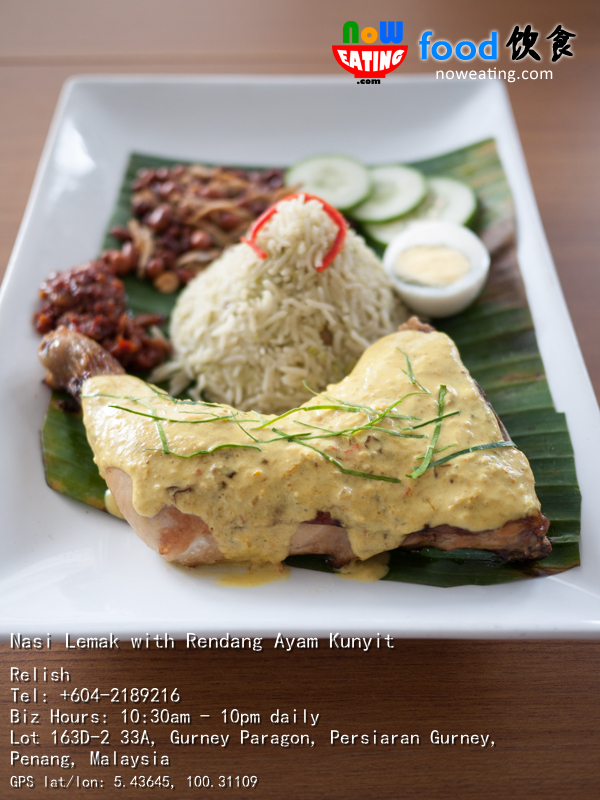 The whole chicken leg is dressed with thick Rendang gravy. The long-grained fragrant rice is best consumed with chili paste provided. Looking for something hot and spicy? 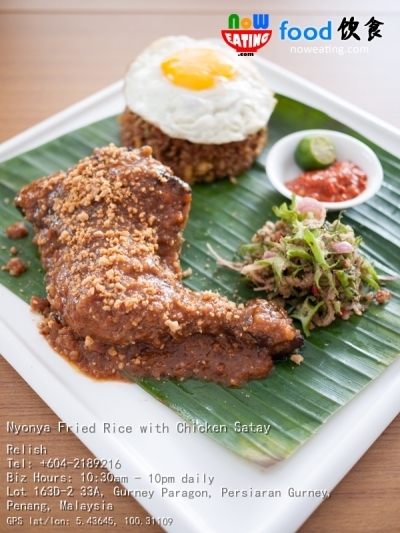 Try the Nyonya Fried Rice with Chicken Satay (RM19.90++). The fried rice is slightly wet in texture and the whole chicken leg is dressed with Satay sauce. Comes with Winged Bean (Kacang Botol) salad. You may notice that most dishes in Relish come with whole chicken leg. After all, they are under TCRS management and you can’t go wrong with their chicken products. 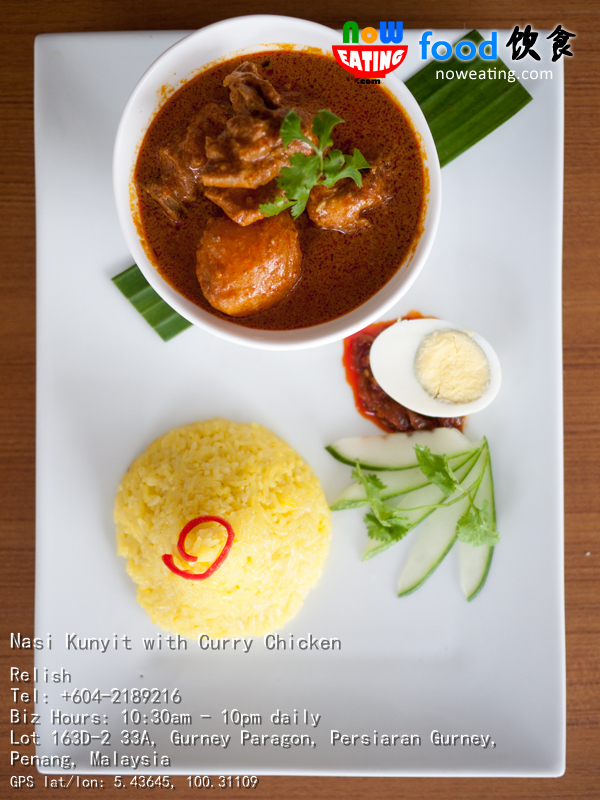 Nasi Kunyit with Curry Rice (RM14.90++) is another Relish’s signature dish. It is also known as “yellow rice” in which the glutinous rice is cooked with coconut milk and turmeric. Best enjoyed with accompanied chicken curry. It is pretty common as a baby’s One-Month Anniversary gift in Chinese community. Inside Relish, you will have a chance to try three variants of Laksa in Malaysia, including Assam Laksa, Nyonya Laksa, and Curry Laksa. Curry Laksa (RM15.90++) is known as Curry Mee in Penang. 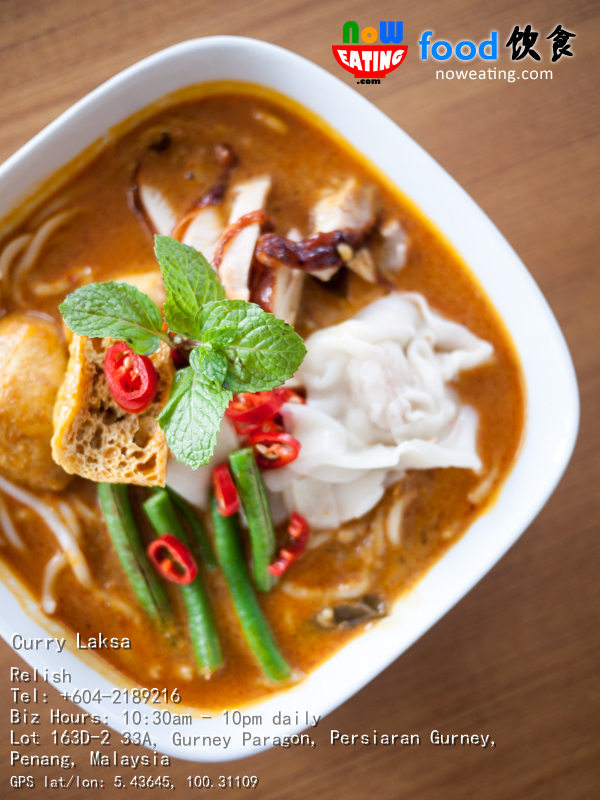 At southern peninsular, locals just call it “Laksa”. 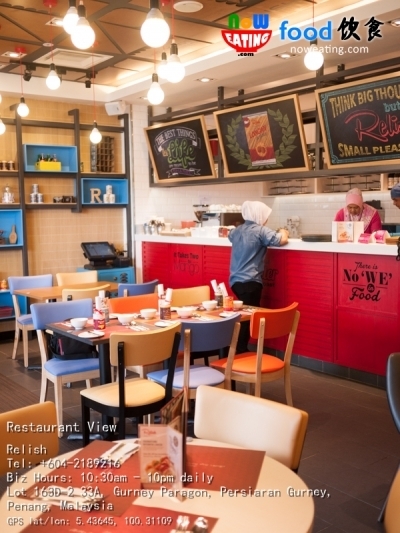 One thing special about Relish version is that it has added shrimp dumpling in it and is using Shanghai noodle instead of yellow noodle commonly used outside. Nyonya Laksa (RM15.90++) is also known as Laksa Lemak with added rich coconut gravy. 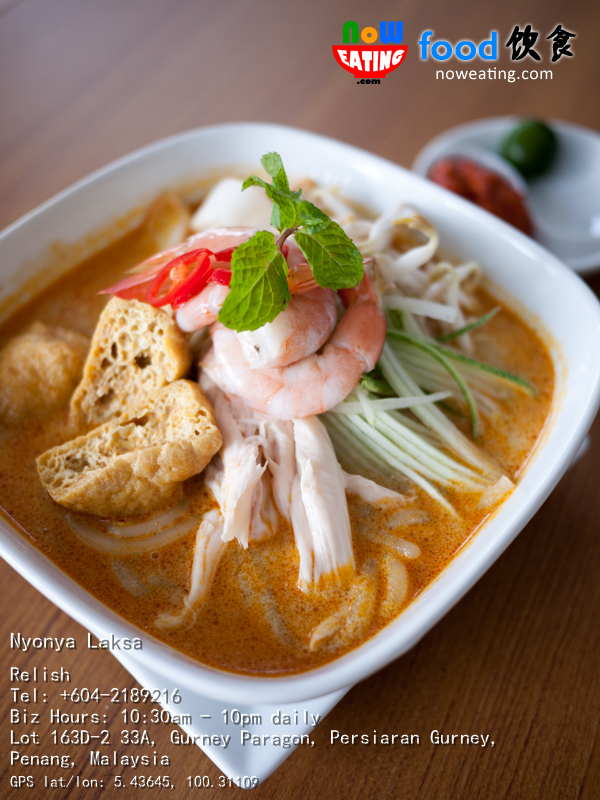 Taste-wise, it has the sourness of Assam Laksa and milky texture of Curry Laksa. Relish version is quite different from Balik Pulau’s Laksa Lemak in which Relish version comes with prawns, bean curd, bean sprout, shredded steamed chicken, cucumber and homemade sambal (chili paste) to stir with the gravy. Spicy Smoked Beef Pasta (RM16.90++) is perhaps the only beef item in the menu. The spaghetti is served with smoked beef in a spicy turmeric coconut milk stew. Perhaps an item caught our attention is this unique Chicken Satay Burger (RM17.90++). 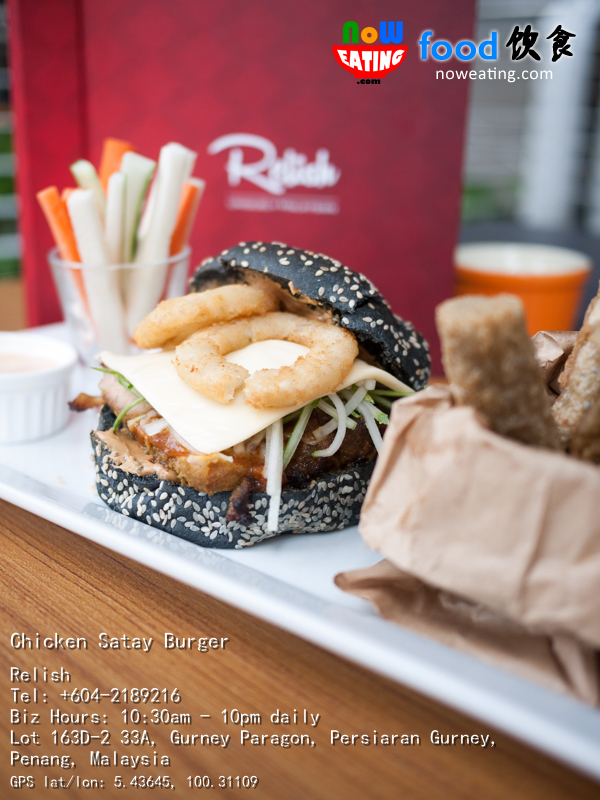 The de-boned chicken thigh patty is topped with Satay sauce, shredded cucumber, cheese, onion rings, and peanut butter in a charcoal sesame seed bun. Instead of having common French Fries as side dish, Keropok Lekor is provided instead. Quite a Malaysian style burger. 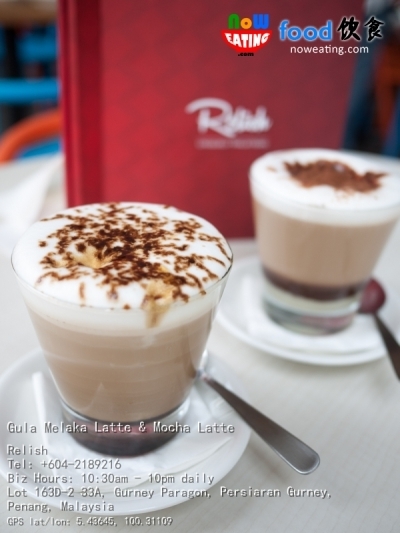 As for the beverage, there is a comfortable selection of signature coffees including the Gula Melaka Latte, Mocha Latte and Gula Melaka Affogato, as well as lose leaf teas such as Moroccan Mint Tea and Chamomile. 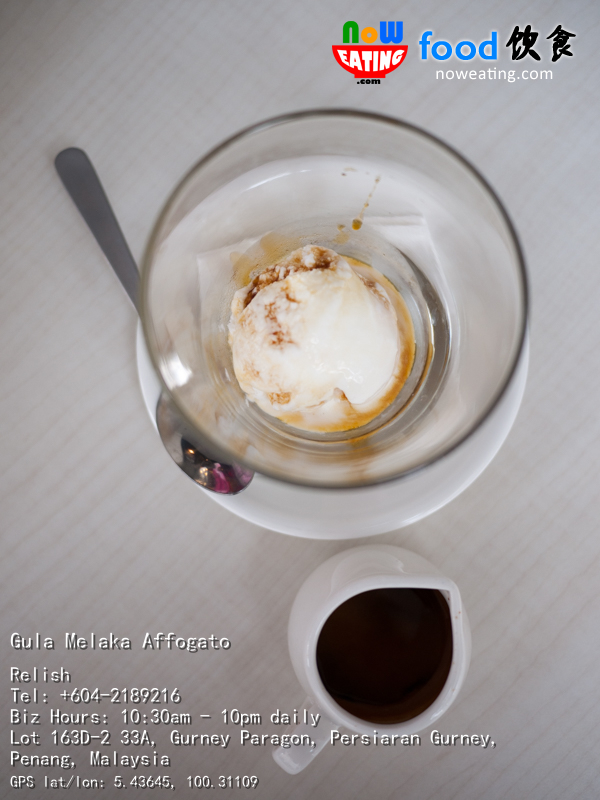 We pretty much enjoy their Gula Melaka Affogato (RM10.90++). Gula Melaka is a type of sugar made of coconut palm and is famous in Malacca state. It has similar taste like brown sugar with a slight hint of caramel. Assorted coolers are also available. We had a chance to try their Strawberry Mojito (RM12.90++) – soda infused with strawberry and mint flavors and Summer Spritz (RM9.90++) – fizzy summer fruit juice with strawberry jelly. 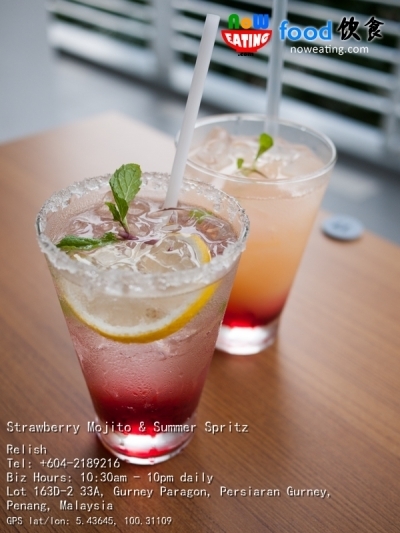 Both are good thirst quenchers during hot day. 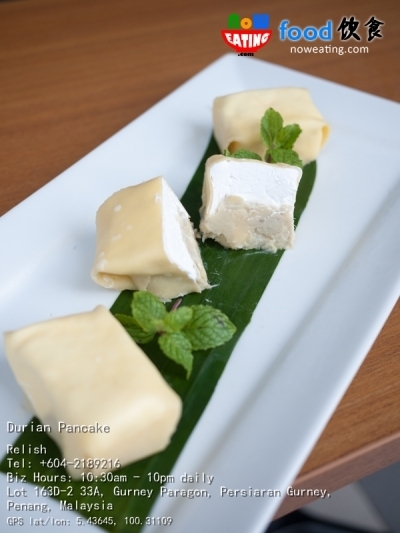 For those who prefer the sweeter side of life, choose from a selection of local desserts featuring the King of Fruits – the signature Durian Pancake and Durian Cendol, as well as Bubur Cha Cha, Mango Mountain and Pulut Hitam with Tong Yuen. It is amazed that such a small kitchen can produce so many delicious Malaysian cuisine. Even better, from Monday to Friday 11am – 3pm, enjoy Weekday Lunch at discounted price, such as Nyonya Nasi Ulam with Ayam Percik at only RM13.90++ (instead of RM21.90++ normal price). With every RM30 spent, you will get 3 pcs of Durian Pancake worth RM9.90++ for FREE!